W-CODE 10 can be regarded as a "quantum-leap" release. 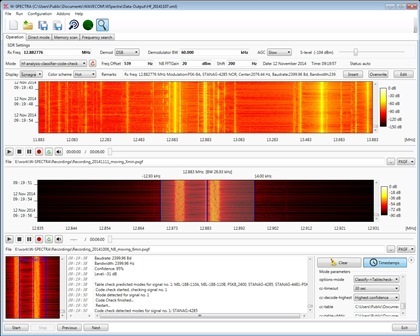 This version includes mainly a new spectrum analysis and signal detection tool  W-Spectrum Analysis (SA). 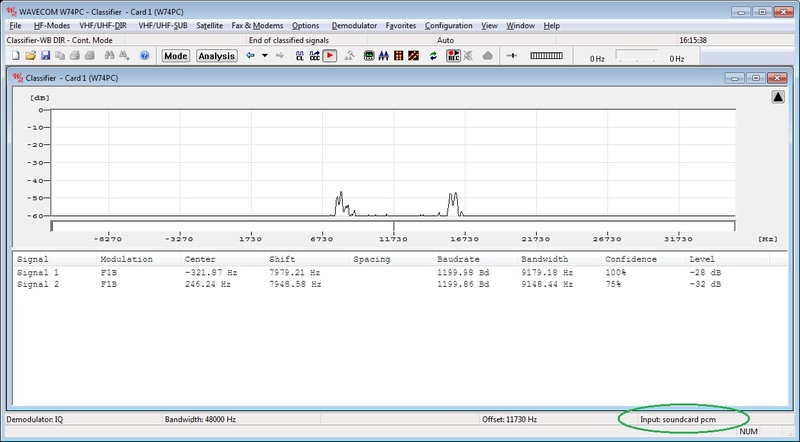 Detect and measure all signals in a selected bandwidth (4k, 24k, 48k and 96kHz). Measuring parameters are signal center (Hz), bandwidth (Hz), level (dB) and detection confidence (in percent). Each signal can be detected in detail containing a number of sub-signals with their parameters. Available in FFT and FFT/Sonagram displays for all radio bands (HF, VUHF and SAT). Detected signals and their sub-signals are marked with their parameters in the display. All results are delivered on the XML remote control interface (XML RCI) for third-party development. Detected signals can be saved with their time-stamp as an XML file for database compatible display and analysis. This is a licensed option and is available for all our HW decoders and W-SPECTRA as well. Substantial improvement of TETRAPOL, using the optimal soft ML decoding for data and voice frames. Enhance the voice quality to get more clear output on the speaker. 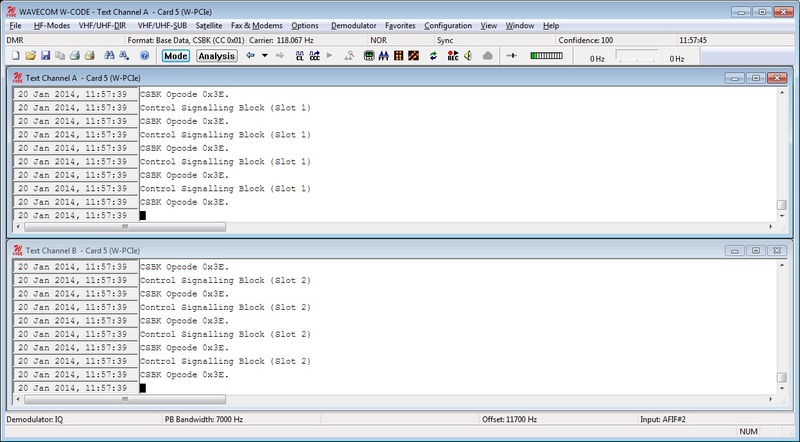 Significant improvement of the equalizer in CODAN-9001 (Codan compatibility mode). Improvement of QAM decoding in MIL-188-110B and CODAN-3212. 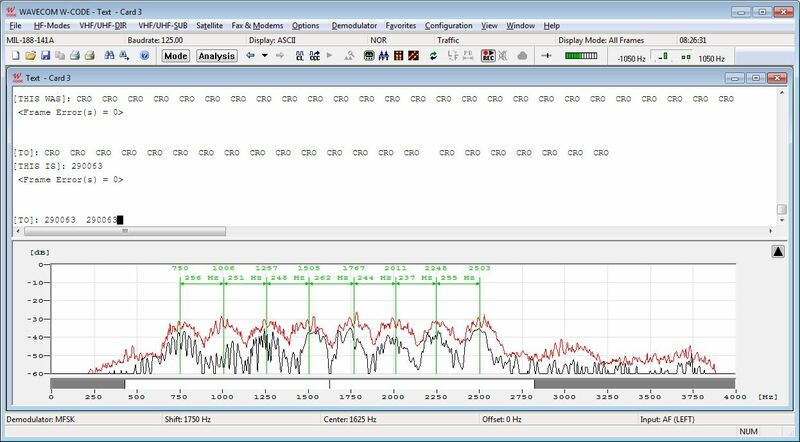 We release the TETRAPOL voice decoding in our decoder series W-CODE, W74PC and W-PCI/e V9.3.0 and the spectrum monitoring product W-SPECTRA V3.0.0. TETRAPOL voice will be decoded to audible voice to the speaker for live monitoring purpose. This requires a Live Voice (W-LV) license option. Each voice session will be saved at the same time to a wav file and the original voice frames in bits are saved to a txt file. This feature is helpful for offline decryption analysis when the voice frames are encrypted. CODAN-9001 extended with CODAN-3212 compatibility mode. Phase plane available for CODAN-9001. CODAN-CHIRP can be classified and recognized by the Classifier-Codecheck. Extension in DMR: Idle data is displayed. TETRAPOL overall decoding significantly improved, using the optimal soft decoding. We upgrade our complete decoding system series and launch two new complete systems. W-PCIe-LAN MK2 and W-PCI-LAN MK2 are complete decoding systems at IF and AF level with two simultaneous decoding lines. They replace the "MK1" series. W74LAN is a complete decoding system with quad-channel input at IF and AF level. W-SPECTRA-LAN is a complete automatic spectrum monitoring system with direct receiver control, signal classification, decoding and database capturing. All systems are implemented in a powerful ruggedized mobile computer with fanless cooling. The host computer has an Intel Core i7-6700TE, 6-th generation desktop CPU. With a dedicated built-in 1 TB solid state disk (SSD) the system is well suitable for various demanding tasks in COMINT/SIGINT: data decoding, spectrum monitoring and wideband signal recording etc. 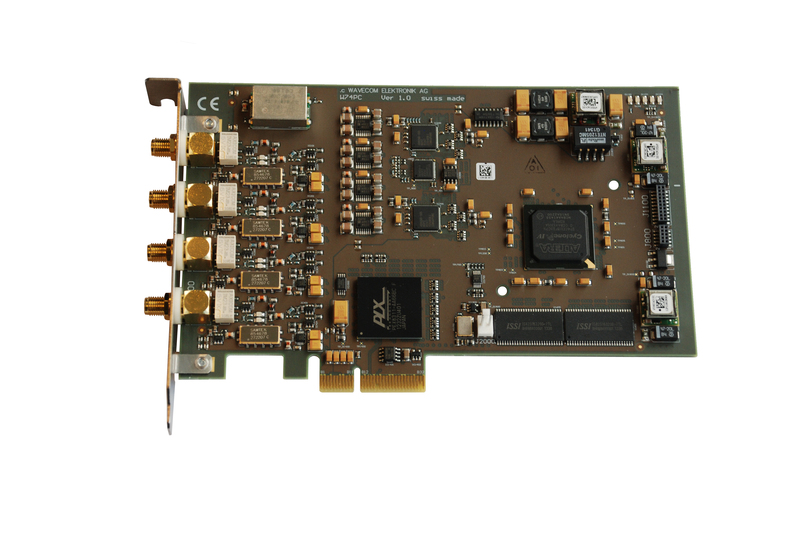 Wavecom hardware devices W-PCI and W-PCIe support the genuine simultaneous dual channel decoding feature (in release V9.2.0). 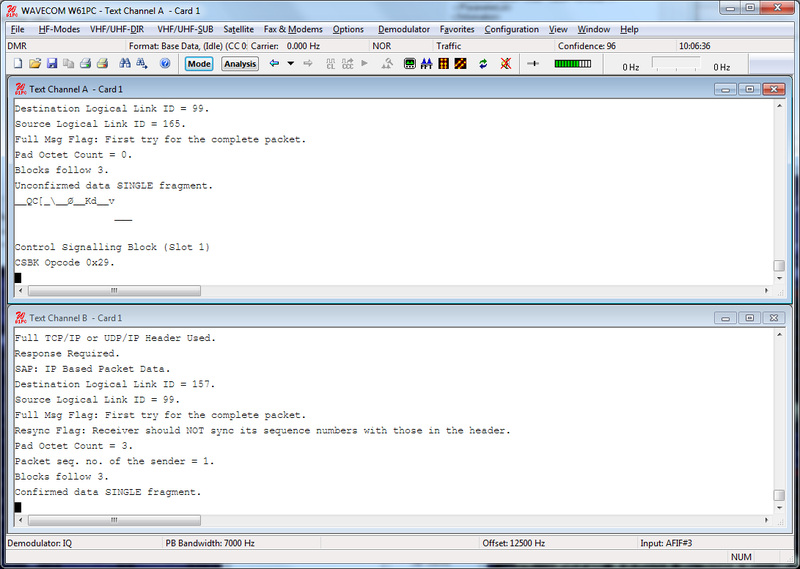 The user can connect two different signals to the two channels and do decoding and analysis at the same time. Please refer to the brocures W-PCI and W-PCIe. This feature is also available in the complete systems W-PCI-LAN and W-PCIe-LAN. All users holding a W-PCI or W-PCIe card can acquire a second license key to use this feature. The upgrade to the newest version 9.2.0 is included. Please use the Software Update form and indicate your card serial number SN#. 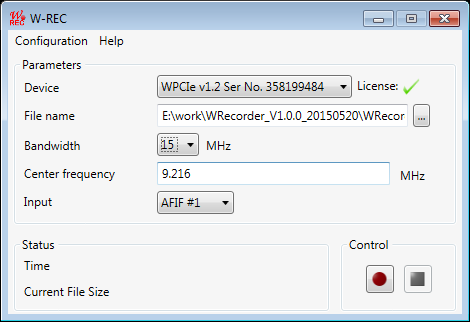 The new release of our wideband recorder W-REC V2.1.0 has significant improvement in the user interface and performance. User can make signal recording in a more intuitive and efficient way. Please refer to the brocure W-REC. The software is available for download. We make a new release of our decoders and applications: Release V9.1.0. All Wavecom decoders and applications are tested and verified on Windows 10. Significant improvement of the TETRAPOL protocol interpreter. Significant improvement of the TETRAPOL demodulator, using the optimal soft-decision to combat power fading in the VHF/UHF communication channel. The demodulation result is visualized in the phase plane. TETRAPOL can be detected by the Classifier Codecheck. We introduce an 8-cursor tuning tool in the FFT spectrum and sonagram. This tool is convenient to measure multi-tone/multi-carrier signals. 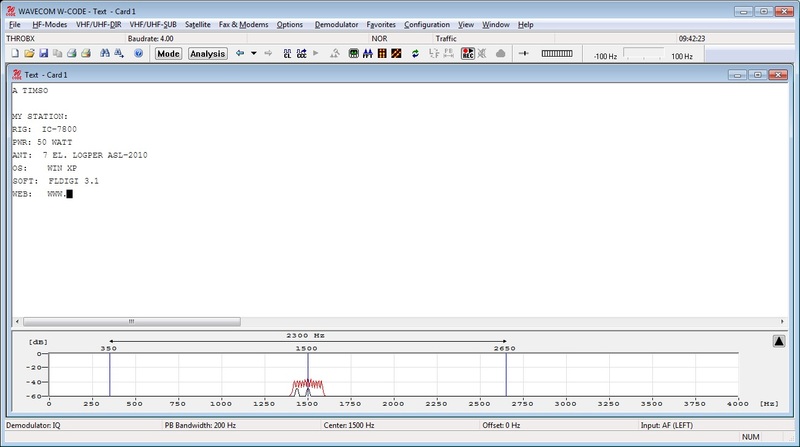 We make a new release of our Automatic Spectrum Monitoring System W-SPECTRA V2.0.0. 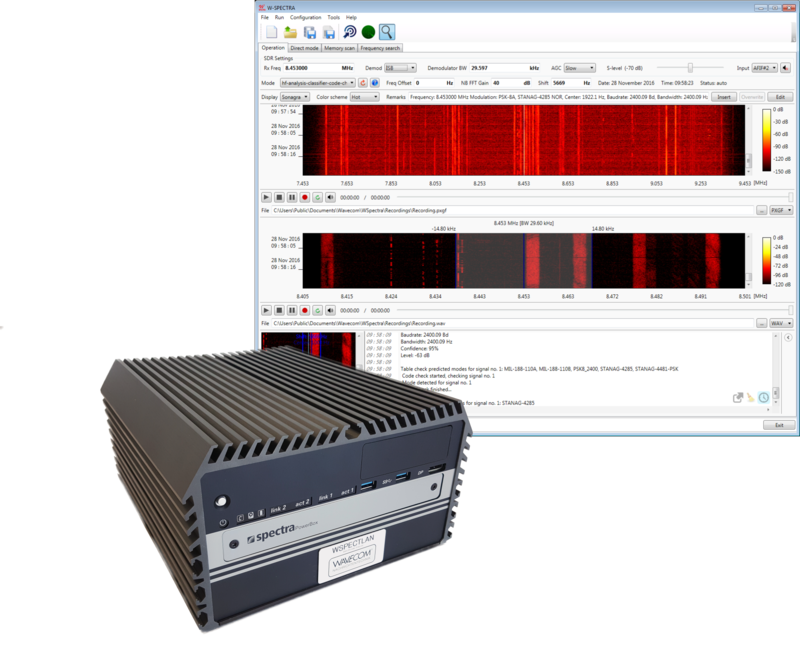 The new W-SPECTRA runs with the native Wavecom receiver W-PCIe as a complete system. It does not require a third-party receiving device anymore. This version contains significant performance improvement and a more intuitive user interface. For details please refer to the brochure W-SPECTRA and the Application Note. 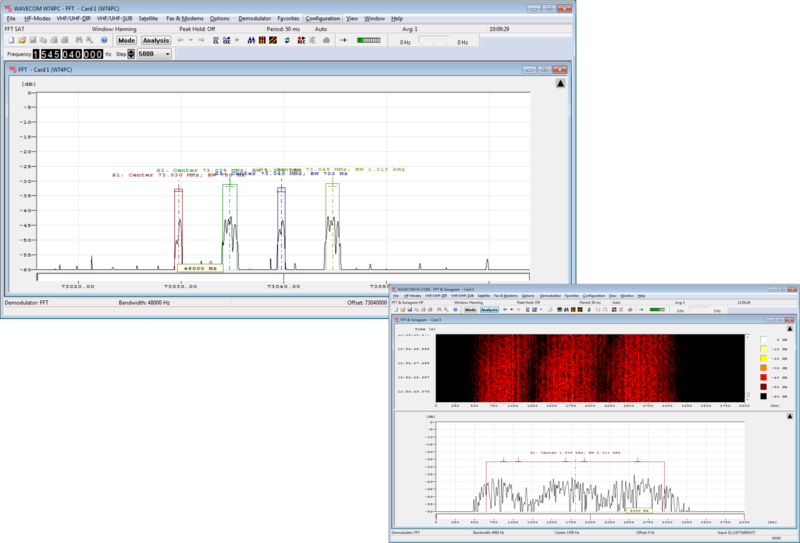 W-SPECTRA-WB-SYS: Complete monitoring system, including the Wavecom W-PCIe receiver and the wideband classifier. 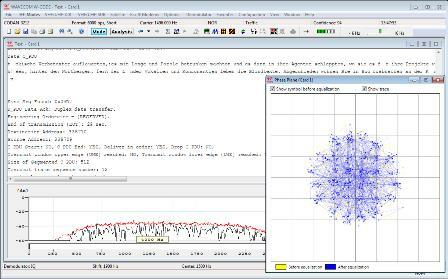 W-SPECTRA-WB: Complete monitoring system with wideband classifier. Software only. Receiving device not included. We launched a new release of our decoders V9.0.0 with PACTOR-4 and TETRAPOL modes. PACTOR-4 is an adaptive transmission mode that provides higher throuput and better communication reliability compared to Pactor-I, -II and -III modes. Pactor-4 mode completes the Pactor series in all Wavecom decoders: W-CODE, W-PCI, W-PCIe and W74PC. TETRAPOL is a digital voice and data communication system for mobile services and used for public safety and civilian PMR (Public Mobile Radio). It is running in VHF/UHF band. The 70 MHz IF inputs of the hardware decoders W-PCI, W-PCIe and W74PC are available for all modes (HF, V/UHF and SAT). 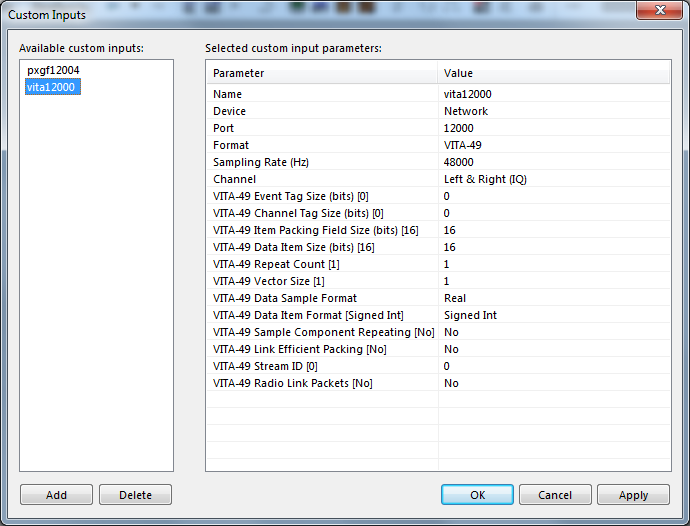 This feature makes our decoders compatible to tuners with a standard wideband 70 MHz IF output. The voice session of DMR, dPMR, NXDN, APCO-25 and TETRA is saved in a separate HEX (bits before the vocoder) file. With this feature the user can further analyze the encrypted vocoder bits. Implement power efficiency mode for the hardware decoders W-PCI, W-PCIe and W74PC. Improvement in HFDL (HF-ACARS) and MIL188-110A modes. Besides recording the whole HF band from an antenna directly, the new release W-REC V2.0.0 records satellite signals at the three 70 MHz IF inputs. During recording the application directs the signal to the speaker for acoustic monitoring purpose. This feature helps the user to have a quick check whether the signal wiring is correct. 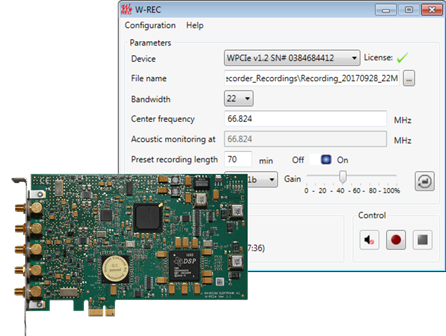 W-RECORDER is an ideal option for the existing W-PCIe decoder card. It records signals at their primary level (from antennae, receivers or down converters etc.) 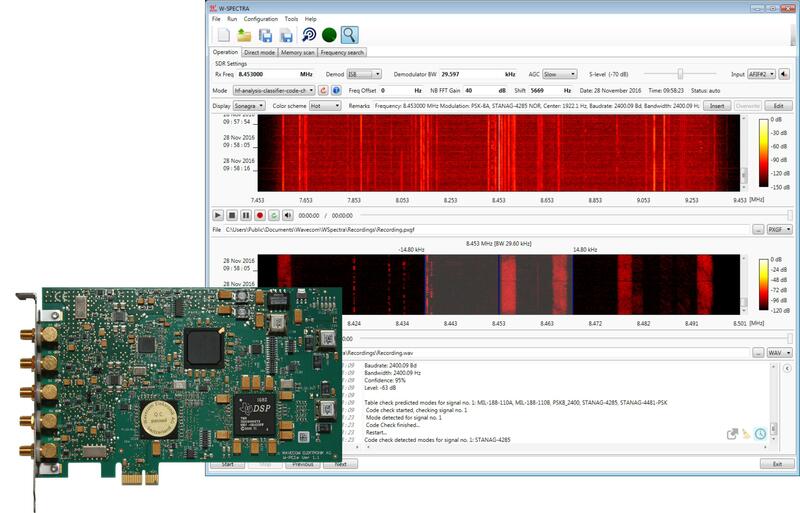 for analysis and decoding with various Wavecom applications or third-party products. Please refer to the product brochure W-REC and the user manual. We made a new release for our decoder products W74PC, W-PCI, W-PCIe and W-CODE version 8.8.0 with general revision on MIL/STANAG modes. General revision of most MIL/STANAG modes with performance improvement. Soft decision in MFSK-8 and MFSK-16 modes. Display the decoding quality parameter "Confidence". 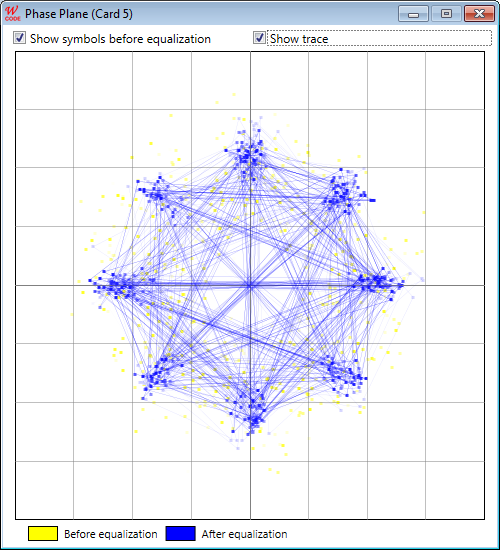 Phase plane extension: display the trace between two neighbour symbols. New XML message indicating the release version number (e.g., 8.8.0). New XML message "License error: ..." when calling VHF/UHF Classifier Codecheck (CCC) without license. License delivered on a new hardware carrier Wibu SD card (CmCard/SD). USB dongle (CmStick/C) still available. We introduce a new hardware license carrier: Wibu CmCard/SD. 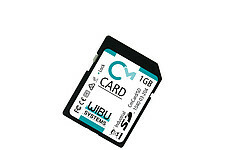 The SD card is especially suitable to use in a mobile PC, e.g., a laptop. Please refer to the datasheet Wibu CmCard/SD. The USB license carrier CmStick/C is still available. There is no price difference between CmCard/SD and CmStick/C. Please just mention in the order if the license should be programmed on a CmCard/SD. 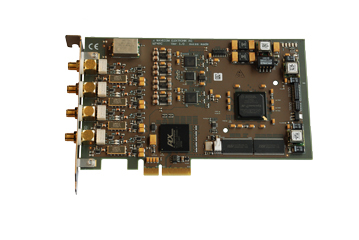 W-REC runs on the Wavecom decoder hardware W-PCIe. W-REC records signals on the two wideband AF/IF inputs (0 -- 25 MHz) directly. 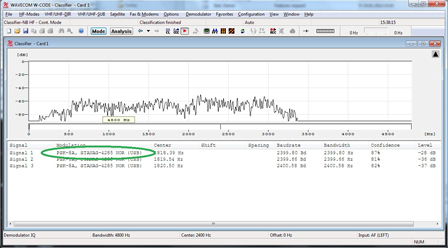 Selectable recording bandwidths, from 4 MHz to 22 MHz. IQ signal recording with 16-bit each part. 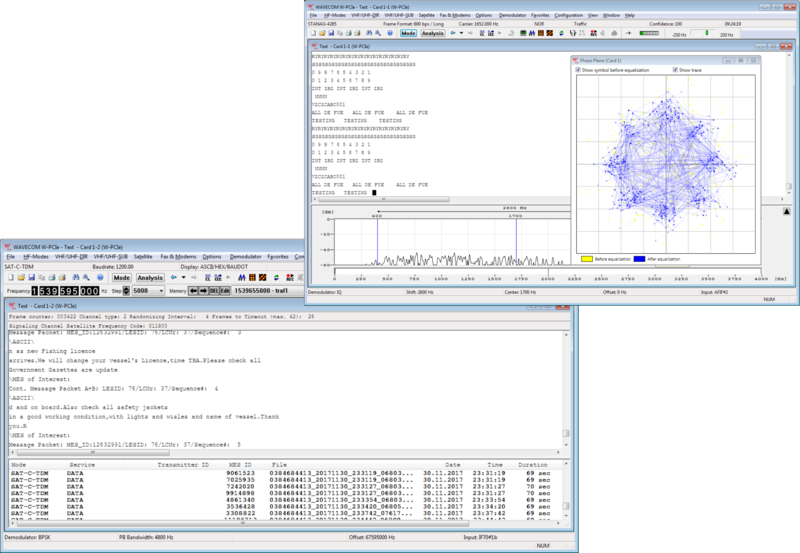 Recording in WAV and PxGF format with on-the-fly side information for complete spectrum analysis and decoding. Compatible with Wavecom decoders and monitoring system W-SPECTRA and other third-party products. Extend Wavecom product suit with long-time signal recording and analysis capability. Please refer to the product brochure W-REC. 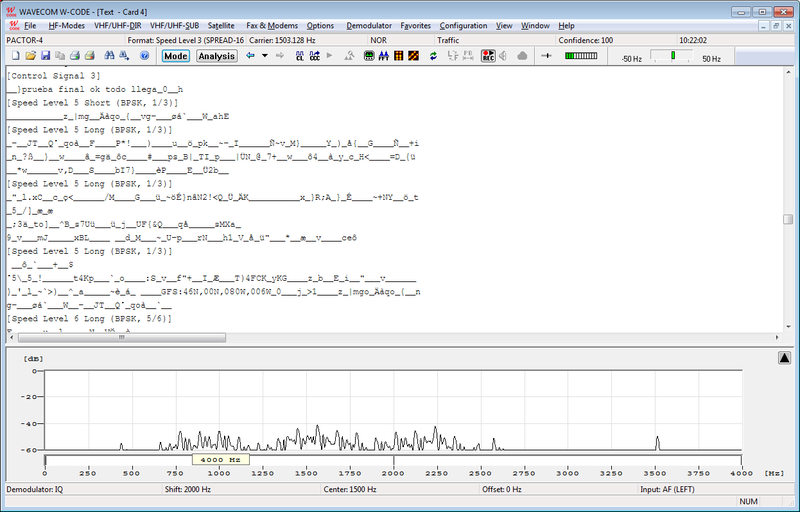 New release of W-SPECTRA and W-SPEED V1.1.0. 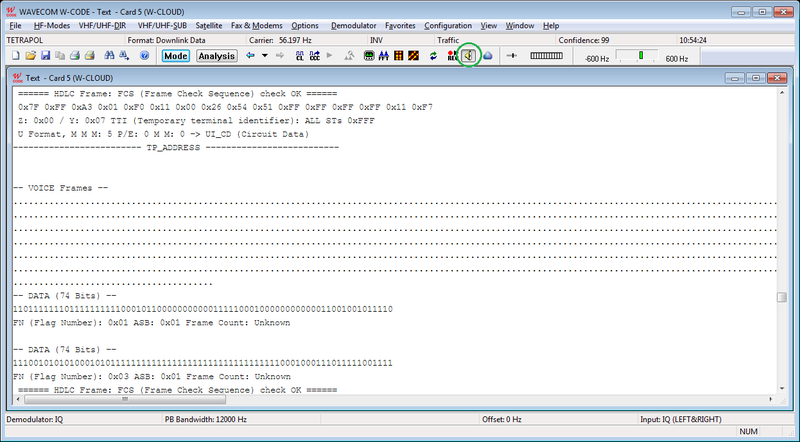 A separate display window in W-SPECTRA for text and graphic result. Extended spectrum display for fine tuning, measuring the center and shift of a signal. Zoom-in sonagram display and spot display with receiver frequency and timestamps. 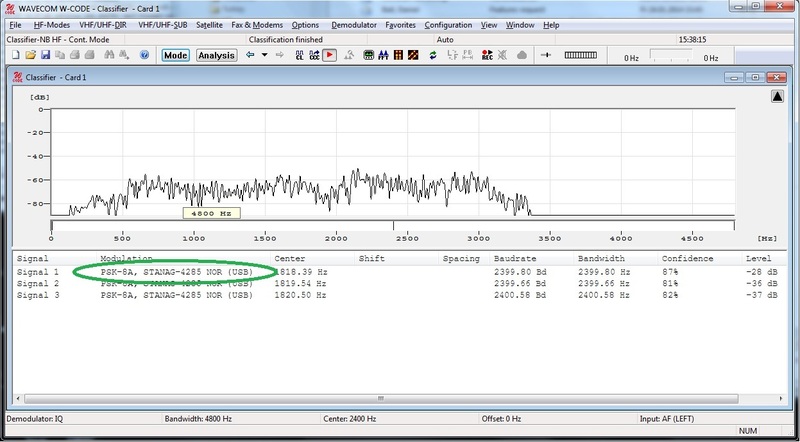 Performance improvement when recording wideband signals. W-SPEED (Spectrum Editing Tool) displays a recording in different bandwidths up to 24 MHz. Tool to convert a WAV recording into PxGF format. We made a new release for our decoder products W74PC, W-PCI, W-PCIe and W-CODE version 8.7.0. Release 8.7.0 supports TCP/IP custom input with ANSI/VITA-49 protocol. New decoders: Aero-P and Aero-C in L-band, Aero-R and Aero-T in C-band. DMR supports two new SYNC types (Direct Mode Slot 1 and 2) according to ETSI TS 102 specification. DMR Protocol Tier I, II and III according to ETSI TS 102 specification series. FFT data can be sent in binary over the XML interface. This reduces the network load. Celebrating 30 years company establishment, we launch 2 new products: W-SPECTRA and W-SPEED. Automatic capturing of classification result into a user configurable database. W-SPEED is a spectrum editing tool. It displays an IQ signal recording in a 2 MHz wide sonagram. 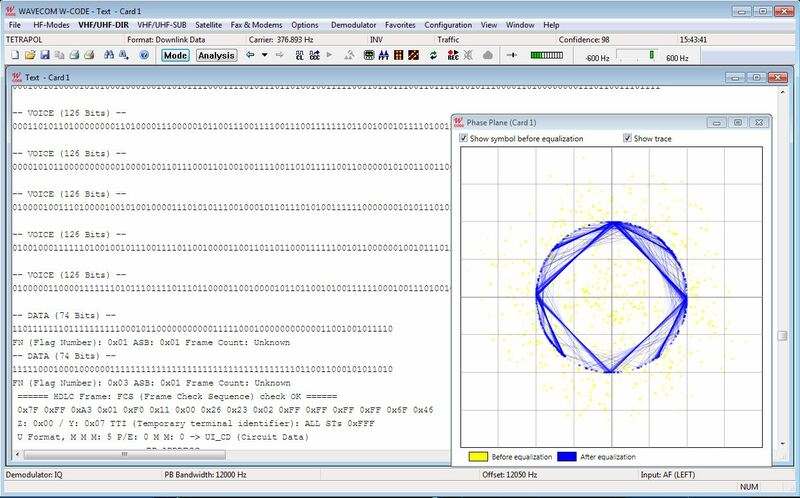 User can cut out any interesting signal in time and frequency domains from the sonagram for classification and decoding. For details please read the brochure W-SPECTRA and the Product Summary. For our current product series please read our publication 30 Years Achievement. From version 8.6.0 onwards Wavecom hardware decoders (W-PCI, W-PCIe and W74PC) and complete decoder systems (W-PCI-LAN and W-PCIe-LAN) include W-CODE. 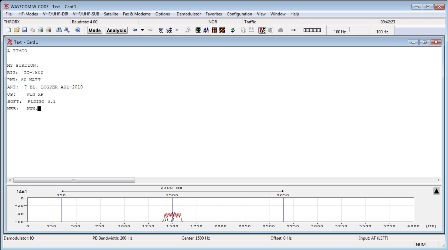 With this extension user can also decode signals from sound devices (soundcard, Virtual Audio Cable VAC and Software Defined Radio SDR, etc.) in the same way as in W-CODE. We make a new release of our decoder products W74PC, W-PCI, W-PCIe and W-CODE version 8.6.0. New SAT decoders SAT-mM-HSD (mini-M High Speed Data) and SAT-mM-C-HSD (mini-M C band High Speed Data). Significant improvements in PACTOR-I, -II, -III and CLOVER-2000. XML interface extension, new parameters. 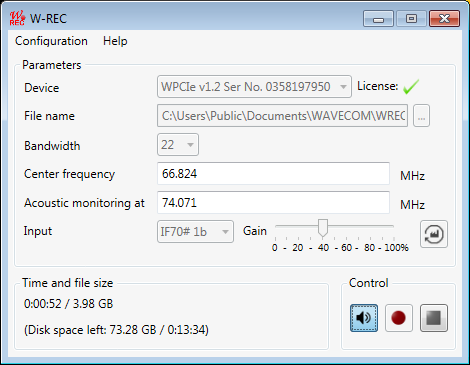 We make a new release of our decoder W61PC version 7.5.0. with the enhanced DMR decoder. DMR catches wide interest in the recent years and is mainly used by public institutions, such as police, transportation etc. With this enhancement both slots can be decoded simultaneously in two separate windows. This release includes significant improvements in various decoder modes as well. We upgraded our LAN decoder systems W-PCIe-LAN and W-PCI-LAN. A spacious 1000 GB solid state disk (SSD) is built in as mass data storage device. This configuration enables our LAN decoder systems to record wideband signals as well  a must-have functionality in signal intelligence (SIGINT). Detail specification see brochures W-PCIe-LAN and W-PCI-LAN. Pending orders will be delivered with this data storage extension without surcharge. No price change in all valid offers. Already delivered Wavecom LAN decoder systems can be upgraded with this storage extension. Please write to sales@wavecom.ch to get a quotation. We have redefined our hardware decoder product line. With the launch of W74PC V8.5.1, W-PCIe and W-PCI run under their own logos as well. dongle is no longer necessary for our hardware decoder product. We have launched a new decoder system in hardware and software  W74PC. and software. No external USB license dongle is necessary anymore. We made a new release W61PC V7.4.00 with an extended Custom Alphabet. 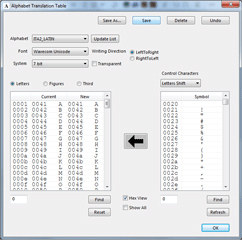 The new Custom Alphabet GUI is extended to incorporate 7-bit and 8-bit Unicode. 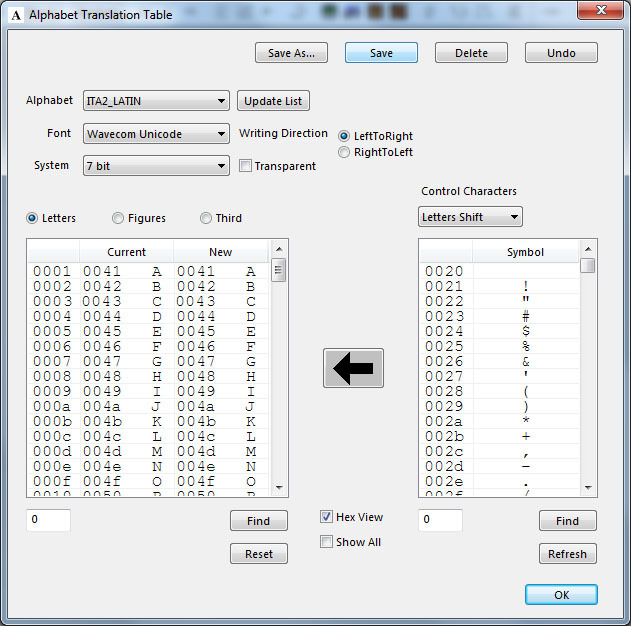 With this GUI user can create an alphabet table to map his own language. Additionally CLOVER-2000 and CODAN-9001 decode with the new Customer Alphabet. From V8.5.0 on our decoders W-PCI, W-PCIe and W-CODE run on Windows 8.1, 7, XP and Windows Server 2008, all 32-bit and 64-bit. New modes: THROB and THROBX. New mode: MIL-188-110A-MOD. This mode decodes a modified version of MIL-188-110A (Serial Tone) in HF transmission. 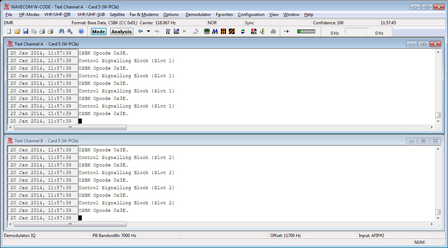 Significant extension DMR: it decodes both slots simultaneously in two separate windows. 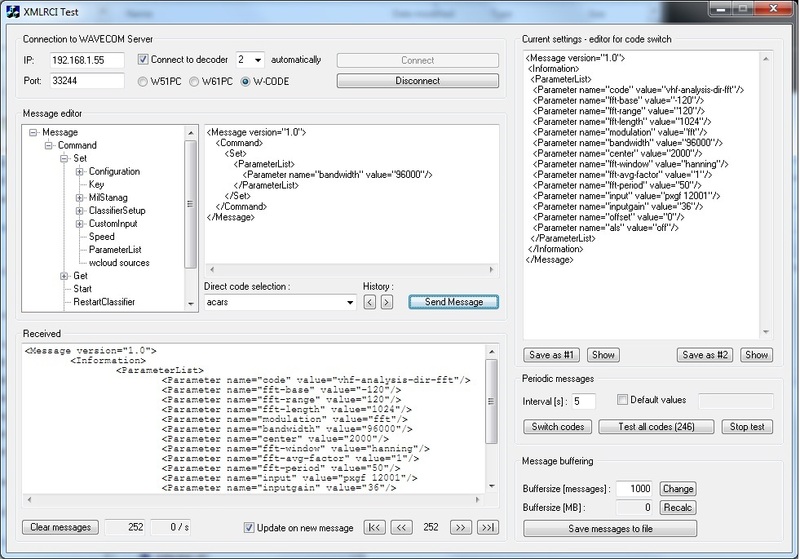 XML Test GUI released in XML SDK for user to run W-CODE without Wavecom GUI. We publish a comprehensive code example in C++ to show how to control our decoders W-CODE, W-PCI, W-PCIe and W61PC via the XML RCI interface. 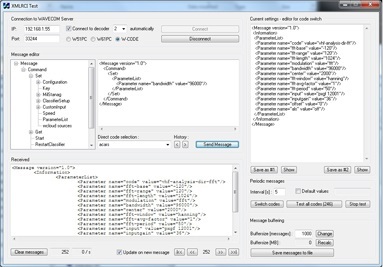 This code example covers the most XML commands and can give users an idea how to write their own applications to use our decoders without Wavecom decoder GUI. Please download the code at Software Download. We have enhanced the DMR (Direct Mobile Radio) decoder significantly. It will be released in W-CODE V8.5.0 end February 2014. 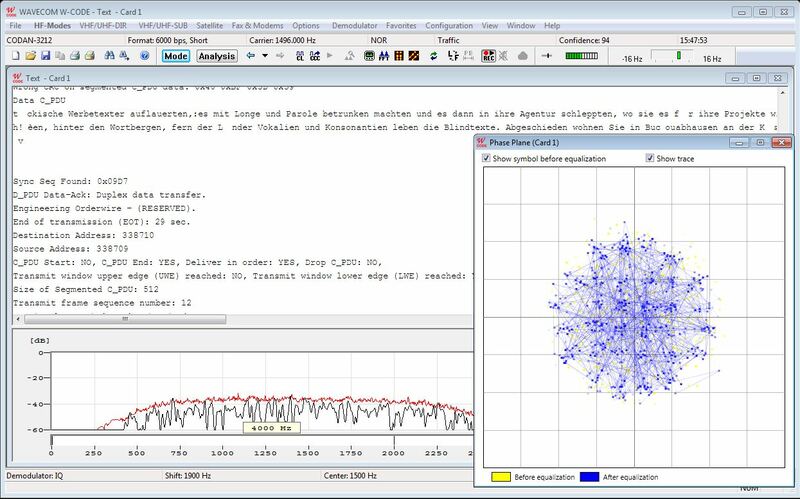 With W-CODE V8.4.00 we launched a new generation of narrowband classifier. CIS-12 is classified as one signal instead of 12 separate OFDM channels. MIL and STANAG signal family is classified to its transmission protocol. Significant improvement in classification result.